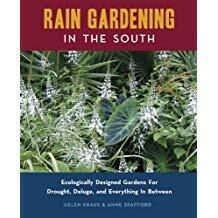 Rain Gardening in the South by Helen Kraus and Anne Spafford is not a new book. However, participating in a symposium last winter at which Anne also spoke, I was so impressed with her talk that I purchased this book. Rain gardens are an integral part of green infrastructure, the need for which becomes greater every day. However, many homeowners and municipalities are resistant to installing them because of poor design that leads to gardens that appear weedy and unattractive. 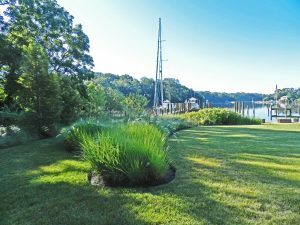 The biggest challenge in designing rain gardens is that they need to cope with both inundation and drought as well as the cleansing of pollutants. 1.A depression created by berming a sloped area or by digging down three to six inches and piling soil around the edges. There should also be an overflow pipe to direct a heavy rain event to a different area. 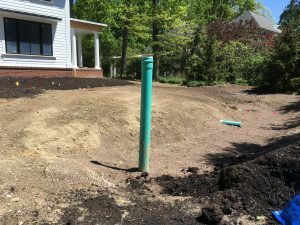 2.The soil may need to be amended so that water will infiltrate and drain quickly. 3.Organic matter should be added to the soil as a mulch or as a soil amendment because it increases the soil’s ability to absorb and drain water as well as fostering the proliferation of microscopic organisms and earthworms. Keep in mind that organic mulches should have large particles to prevent being washed away during a heavy rainfall. 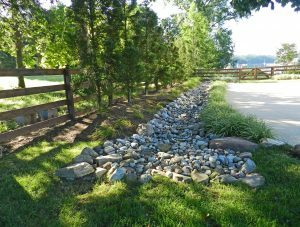 5.If rocks are used to slow stormwater velocity or to create swales, they should be designed to flow with the natural contours of the landscape. Then they discuss designing a rain garden. Like any other type of garden, the first step is a detailed analysis of the property which includes the water flow, the slope or flatness, the sun/shade pattern, the views, existing significant vegetation, and either underground or overhead obstructions such as buried pipes and utility lines. The next step is making sure that the rain garden will be at least ten feet from the house. The third step is deciding whether to create the rain garden as a stand alone feature or whether to choose the plants so that it blends with the other beds. Helpfully, the authors provide the tools for calculating the desired size of the rain garden. 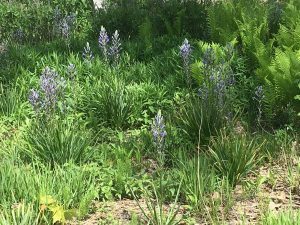 They also dispel two myths about rain garden plants. Drought-tolerant plants are not the answer in most instances because they tend to rot if their roots stay wet. They can be used at the top of deep rain gardens but never further down. The other is the belief that native plants are always better. For reasons that the authors explain, the best solution is using a mix of native and non-native plants. Their chapter on plant selection and design is excellent and many of the plants can be used in Ohio even though the authors live in North Carolina. Two other chapters on troubleshooting and alternatives to rain gardens are also extremely helpful. Don’t be misled by the title of this book; it is just as applicable to those of us in Ohio as it is to those who live in the South. Rain Gardening in the South: Ecologically Designed Gardens for Drought, Deluge, and Everything in Between, Eno Publishers, Hillsborough, North Carolina, 2009.